"This recipe was given to me by my mother-in-law. It is always served at family get togethers and BBQs. You can use regular peeled and cubed potatoes if you can't find baby potatoes." Place the potatoes in a large pot with enough water to cover. Bring to a boil, and cook 15 minutes, or until tender. Heat the olive oil in a skillet over medium heat, and cook the onion and garlic until tender. Drain potatoes, and return to the pot. Pour in the cream, and mix in the onion, garlic, and dill. Bring to a boil, reduce heat to low, and simmer 20 minutes, stirring occasionally, until thickened. Season with salt and pepper. i tried and loved this recipie. i made it for a family barbeque and everyone just loved it. no leftovers. Wow. 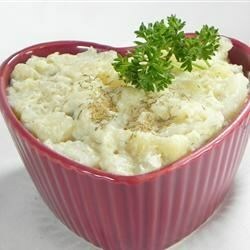 Best mash potatoes ever. Took alot of dill. Drizzled crumbled nachos on top. This is definitely a keeper! It is sooo good. I took these to a potluck and everyone loved them. A few changes I made was using 1/2 the amt of cream and adding some extra garlic for more flavor! Wonderful recipe!